Following the news of his provisional suspension after tests on a urine sample taken at July’s Tour de France had revealed minuscule traces of the banned drug clenbuterol, three-time Tour champion Alberto Contador has presented his side of the story in a press conference in his home town of Pinto this afternoon, claiming the positive test – which carries a potential suspension of up to two years – came as a result of eating contaminated meat before providing the sample. The UCI itself affirmed in front of me that it was a case of food contamination. This is a genuine mistake. I think it will be resolved in a clear way, with the truth up front. [The UCI] understands that is a special case, which has to be examined. I’ve spent a month and half keeping this inside, without sleeping. My family didn’t find out until last night. This is a real error. The system is very questionable and it has to be changed. I cannot tolerate the idea of a possible sanction. Contador explained that he must have inadvertently consumed a tiny amount of clenbuterol in meat he had eaten both the day before and the day of the control. Fellow Astana teammates who had also eaten the meat were not tested along with Contador; Alexandre Vinokourov was, but had not eaten the alleged contaminated meat. It’s actually impossible to take such a small amount. The administration of it is just not possible. So this points again to food contamination. Moreover, regarding performance, this amount is totally insufficient and doesn’t serve anything. I think there’s a very strong chance that this is being blown way out of proportion because it’s a microdose and it was on a rest day and it makes no sense. It makes no sense because it would have come up in other controls. It’s a shame that it’s been released when it hasn’t been resolved. I think it’s something that should be resolved behind closed doors and done the way it should be done properly. There are strict rules and I think unfortunately in cycling for the right reasons we always jump to the worst-case scenario and because of the history we have in the sport unfortunately maybe Alberto’s just maybe been kind of thrown to the sharks. I think it will get resolved and I hope so for Alberto’s benefit and I hope so for the sport’s benefit. Contador’s food contamination defence is a plausible one with a number of historical precedents. Chinese cyclist Fuyu Li was provisionally suspended in April after testing positive for a similarly minute level of clenbuterol. Dutch anti-doping expert Douwe de Boer subsequently stated that the amount found in his body points “clearly in the direction of a contamination” and that such a low dose would not help his performance. American swimmer Jessica Hardy was given a one-year suspension after a positive clenbuterol test in July 2008, but the Court of Arbitration for Sport later accepted her claim that she had ingested it in a contaminated food supplement. And French tennis player Richard Gasquet escaped sanction after successfully – and uniquely – claiming that a positive test for cocaine came as a result of a kiss in a nightclub. Are the UCI too trigger-happy? The issue facing cycling and the UCI is how to strike the right balance between transparency and hysteria. The authorities are keen to display their openness and vigour in pursuing doping cheats, but in cases such as these there is a danger of throwing the innocent on to the less than tender mercies of an eager media who will happily trumpet – in the most black-and-white terms – the latest scandal to engulf the sport, without considering the validity of a rider’s defence or the incomplete nature of any scientific analysis. It is a major problem for the sport which periodically threatens to tear it asunder. The UCI knows that cycling has a bad reputation among the wider sporting public and is desperate to be perceived as taking a hard line on cheats. But at the same time, if the UCI adopts a premature, trigger-happy approach which makes much ado about the tiniest of test results – which is what, to my eye, appears to be happening here – they run the risk of shooting themselves in the foot. If they consistently choose to light the blue touch paper, they cannot complain when ultimately innocent cases explode in their faces. As Lance Armstrong will attest, throw enough mud often enough and some of it will inevitably stick. There are enough people out there already willing to do just that without the UCI offering them further ammunition. As reported on Spanish radio this morning, the UCI have now confirmed that Vuelta a España runner-up Ezequiel Mosquera and David Garcia Da Peña, both of the Xacobeo Galicia team, tested positive during the Vuelta for hydroxyethyl starch, which increases blood volume, allowing red blood cells to deliver oxygen more efficiently. Both riders have requested testing of their B samples. 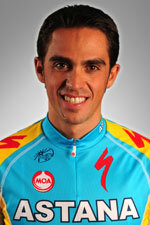 The 34-year old Mosquera signed a lucrative two-year deal with the Dutch Vacansoleil team earlier this month. His performance at the Vuelta was a huge publicity boost for the Xacobeo team, which is desperately trying to raise sufficient funds to continue next year. Today’s news will be a terrible blow to the team’s future prospects, although the convenient – deliberate? – timing of its release in the aftermath of the Contador suspension will likely minimise the collateral PR damage the team will suffer.